Naturalizing your shoreline is easier than you think and the long-term results are stunning! And by maintaining a natural shoreline, you’re doing your part to conserve a healthy lake and a thriving wildlife population. A shoreline rich in vegetation has so many benefits, not the least of which are minimal maintenance, cost-effectiveness and the chance to design something unique. Also, a natural shoreline is the best defence against erosion, as the roots will help hold the soil in place and filter the runoff that flows into the lake. If you have a grassy shoreline try not to mow it. Short grass acts as a hard surface that allows polluted rainwater to flow straight into the lake. These can negatively impact the aesthetic appeal and limit recreational opportunities. The ideal natural buffer width is at least 30 metres, but any buffer is better than no buffer! They’re cost-effective, ecologically responsible and stunning. Your shoreline was meant to be naturally beautiful. Here are before-and-after photos and testimonials from actual shoreline property owners. They all naturalized their shorelines. This property had some obvious erosion issues with exposed soil, a mowed lawn to the water’s edge and no natural buffer. Due to the lack of vegetation, the shoreline property owners decided they needed to naturalize their shoreline to prevent any further soil loss. After naturalizing their shoreline with 112 plants 4 years ago, the plants have flourished. This is now a completely natural shoreline that has done tremendous work to reduce erosion and excess nutrient runoff, and provide vital habitat to fish and wildlife. After naturalizing their shoreline with 112 plants 4 years ago, the plants have flourished. This is now a completely natural shoreline that has done tremendous work to reduce erosion, reduce excess nutrient run off, and provide vital habitat to both aquatic and terrestrial wildlife. Download Jackson Plan in PDF format. When the Love Your Lake team assessed this property, they noted an obvious slope to the property that had some exposed soil (erosion) and an undercutting of the bank. These issues could be due to little to no vegetative buffer, lawn to the water’s edge and wave action from the lake. It was enough to recommend the planting of native shrubs and trees to mitigate soil loss and enhance water filtration. The Natural Edge team came to the property and planted a variety of native plants including highbush cranberry, meadowsweet and pasture rose. In total 73 plants were planted. After four years, the plants are thriving, a strong root system is holding in soil and overhanging foliage is breaking up waves and lessening the impact on the soil. Download Mariotti Plan in PDF format. There was a buffer along this property, but most of it was aquatic plants with submerged root systems that did not properly filter water runoff. By planting native shrubs and trees within the soil along the shoreline, the owners could reduce the chances of erosion. The increased buffer along this shoreline has been very successful. The native shrubs and trees have done a great job providing essential wildlife habitat, water filtration and erosion control. Download Wright Plan in PDF format. The shoreline of this property had a few trees and some ornamental plants. With a slope along the shore and little vegetation, this risk of erosion was high, there was little to no wildlife habitat and insufficient water filtration. Four years later, the naturalization of the shoreline has taken very well. The shrubs have grown with spreading root systems that has helped with the stabilizing of shoreline soil. The increased vegetation along the shoreline has also helped to break up rainfall, reducing the impact on sensitive soils, and allowing runoff to absorb into the ground. Download Zabloski Plan in PDF format. Shoreline vegetation filters polluted and contaminated runoff before it flows into the lake, preventing an altering of the water chemistry and excessive algae blooms. The shade cast by plants provides fish and other wildlife, as well as people, with relief from the summer sun. Shade also reduces water evaporation from the soil. This is helpful for plants that require moist or wet conditions for survival. Buffers can reduce flooding by slowing the velocity of surface runoff so it absorbs into the ground and becomes groundwater. This reduces the amount of direct drainage into the lake, limiting flood potential and helping the lake regulate its water levels more easily. 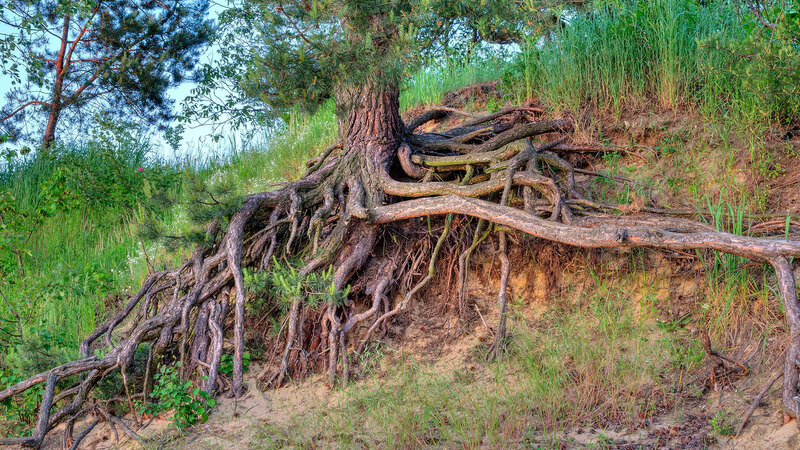 The vast network of roots under a natural shoreline holds soil in place and prevents shorelines against slumping and washing away. The leaves above ground reduce the impact of rain and surface water on the soil surface, and also the severity of wave action from water currents and boat wakes. Natural shorelines protect property values from decreasing due to loss of land, wind or water damage, and poor water quality. At the same time, as waterfront views improve, so too does the price of the property. 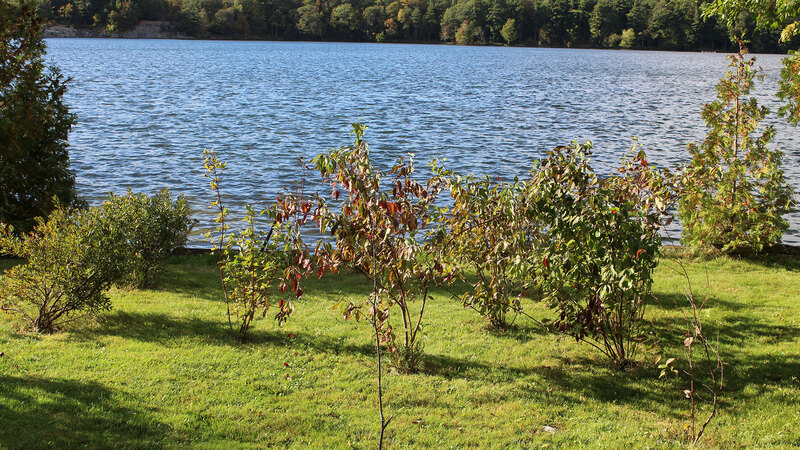 Naturalizing your shoreline can be one of the easiest ways to ensure the health of both your lake and property. Native vegetation is naturally suited to withstand the climate, soil types, and environmental conditions of local and regional areas. A combination of shrubs and trees creates the best root system to hold soil and filter water runoff. Trees have large wide-spreading roots; shrubs have smaller deep-penetrating roots. The presence of both creates a basket root system that, like a rebar, ensures soil stability. Planting or removing in-water plants may require permitting. Check with your local conservation authority before proceeding. Having a natural shoreline can increase your property value, as it’s less likely to erode and it helps improve water quality. Fertilizer increases the risk of excess nutrients flowing into the lake and increasing the possibility of blue-green algae blooms. Before you begin, determine the conditions of your property and make a layout plan. The former will inform your species choices, while the latter will ensure access to the water and any recreational areas, and low-lying shrubs in areas with better views of the lake. When choosing plants, refer to Ontario Native Shoreline Plants or National Native Plant Encyclopedia to find suitable plants for your property (please be aware that some of these species are unavailable at local nurseries). Contact your local nurseries to find the native plants you would like to use. Check out our Native Plant Supplier List. While native vegetation will be largely maintenance-free after two to five years, the first few years will require occasional watering or pruning. We’ve outlined some tips below courtesy of The Natural Edge program, or you can download The Natural Edge Native Plant Care Guide. How much water do plants require? Water trees and shrubs early or late in the day at the base of their trunk or main stems. This will ensure water reaches the roots before evaporating from the surface, and will limit surface runoff. During times of considerable rain, weekly watering may not be necessary. Summer watering is only required during periods of drought when all trees and shrubs should receive between 30 and 40 litres (6-8 gallons) of water weekly. Observable signs of drought can include: small, yellow or brown leaves, drooping leaves, loss of crown leaves, and blistering or cracking bark. Spring is the best time to re-mulch trees and shrubs, if required. Old mulch should be removed before new mulch is placed, or can be mixed together instead of layered. Mulch should cover the spread of the roots underground. When adding mulch, it should extend as far out as the bottom branches of the shrub or tree, with a depth of 5-10 centimetres (2-4 inches). The mulch should form a conical shape, being thicker at the perimeter to funnel water inward to the base of the trunk or main stems. And to avoid rotting, the mulch should not touch the trunk or main stems. Pruning is a technique used to help support the growth of trees and shrubs. Most native shoreline vegetation will require little to no pruning at all. However, some pruning will maintain sightlines, provide better access to the water and keep the plants healthy. Branches that are dead, diseased or damaged should be pruned to protect the plant from further health risks. If necessary, branches can also be pruned to thin a shrub if it has obstructed pathways or sightlines to the water. It can be helpful to keep tabs on a shrub or tree over the course of a year to get a better idea of which branches should be removed without compromising the natural shape of the plant. Some shrubs and trees produce suckering branches that emerge from underground roots near the trunk or base of the main stem of the plant. 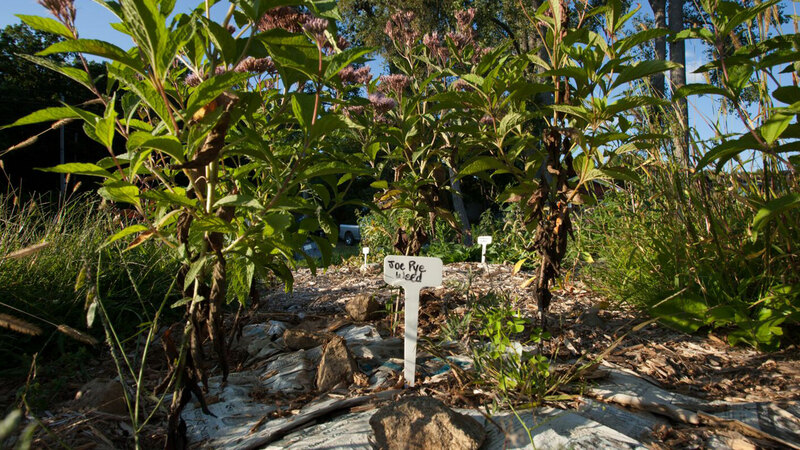 While suckers can aid in stabilizing and naturalizing a shoreline, they can also limit the nutrients reaching the canopy layer of the main shrub or tree. For this reason, they should be pruned to ensure the main plant does not die off. When pruning trees, make sure you don’t remove the crown bud (the highest budding branch on the tree) as this forces the tree to grow wide instead of tall. Late fall and early winter is the best time to prune, as this will minimize sap loss and the threat of fungal or insect infestations. Wait for leaf loss to begin so you have easier access to the branches. Dead branches can be pruned any time. However, some shrubs, usually those that flower, should be pruned in the early spring before the buds emerge, or after the flowers have died. Removing the dead flowers can help the shrub leaf out nicely by encouraging nutrients to access the leaves. How much needs to be pruned? Pruning should never remove more than 25% of the crown of the shrub or tree. This will reduce its vulnerability to fungal or insect infestation. Branches should compose at least two-thirds of the shrub or tree, to ensure that the vegetation has enough mature leaves to support growth and survival. Once shrubs begin to show signs of aging, rejuvenating pruning can be done to encourage new growth to emerge. Gradual rejuvenation involves removing old growth by one-third every year until all old growth has been removed. Complete rejuvenation involves cutting the entire shrub back until just the stump remains, about 15-25 centimetres (6-10 inches) above the ground. Before you start, look over the entire shrub or tree to determine the right branches to trim. When you cut, do so at the branch collar (where it is attached to its parent branch or to the tree’s trunk) to reduce the risk of unwanted damage and infestation, and allow for faster healing. And be sure to clean tools after every tree or shrub before starting on another one, as infection and disease can spread from plant to plant via pruning tools. Possible disinfecting solutions can include one part bleach, dish soap or pine oil cleaner in three parts water. Make a wedge shape cut, roughly one-quarter of the branch diameter, on the underside of the branch, and approximately 12 cm (5 inches) from the branch collar. This wedge-cut is not intended to remove the branch. Approximately 20-30 cm (8-12 inches) away from the branch collar, farther than the wedge-cut, cut the branch completely, starting at the topside of the branch. This will leave a branch stub with the initial wedge cut. Cut off the stub by cutting parallel to the branch collar. Do not cut the collar. Cutting the collar can damage the tree or shrub by increasing healing time and susceptibility to infection. For diagrams and more pruning tips, download the free Native Plant Care Guide courtesy of The Natural Edge. Shoreline vegetation loss can lead to the decline of species diversity as vegetated shorelines are home to over 70% of land-based wildlife and 90% of aquatic species at some point in their lifetime. As plants along the shoreline grow, the branches and leaves will overhang creating shade. Small fish and frogs often hang around in shaded areas as it protects them from the sun and birds that may be preying on them. As well, overhanging plants provide a source of food as insects will often fall into the water for the waiting fish. Trees and branches that have fallen into the water or along the shoreline should be left alone. Woody structures such as trees and branches are great fish and wildlife habitat. They act as cover for small fish and other aquatic life as they can be used to hide from predators, and protect species from the sun and overhead birds. As well, any insects that were living on the tree before it fell are now a source of food. 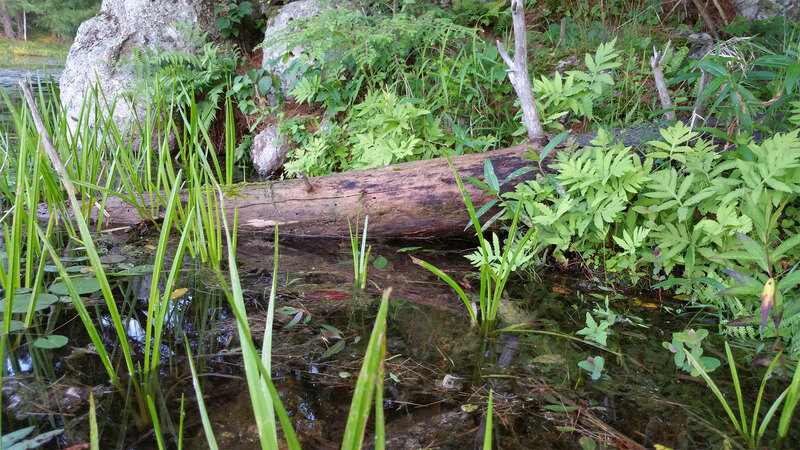 In addition, these logs create an easy transition from land to water for many frogs and turtles. Turtles can often be seen basking on downed trees to warm themselves up. Aquatic vegetation such as water lilies, and emergent plants such as bulrushes are another key habitat feature for small fish and amphibians. Many people remove these plants as they want beach-like swimming areas. However, by pulling these “weeds” shoreline property owners are directly destroying primary habitat. The best way to access your lake is to clear a small area through the existing vegetation to get to deeper water, and leave the rest untouched (removal of aquatic plants may require permits, please contact your local Conservation Authority or Municipality) The aquatic vegetation is important as it is used for shelter to escape predators, protection from the sun, and food. In addition to naturally occurring habitat, you can also create habitat by placing bird and bat houses on your property, and by planting a native wildflower garden to attract pollinator species. Download your free Shoreline Habitat Creation Manual provided by The Natural Edge program for more details. Need Help Naturalizing Your Shoreline? 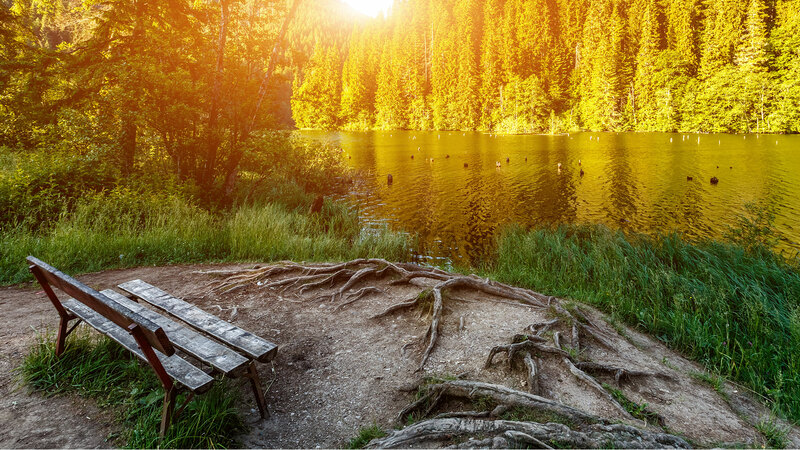 A natural shoreline can be one of the easiest ways to ensure the health of both your lake and property. The Natural Edge program has partner organizations in Ontario, Saskatchewan, and Alberta who can assist you in the naturalization of your shoreline. We are currently working on expanding further across Canada to help as many landowners as possible. When you call for help, we will determine if you qualify for a site visit. If we visit your property, we would conduct a shoreline assessment and work with you to create a personalized planting plan to best suit your property, taking into account areas of concern, access points, seating areas and personal preferences. Once you approve the planting plan we will schedule a planting date and come fully equipped with everything needed to complete the naturalization. Our specialists create planting plans based on land characteristics (soil type, moisture level, etc…), and landowner’s preferences (sight lines, heights, flowering vs non flowering, etc…) doing our best to customize it to your needs.